We’d love your help. 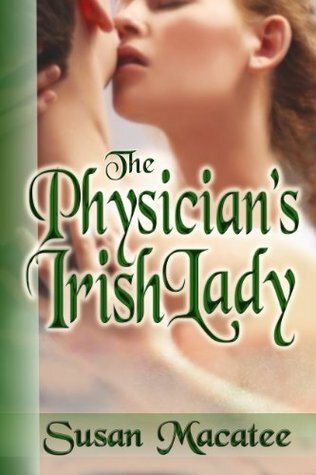 Let us know what’s wrong with this preview of The Physician's Irish Lady by Susan Macatee. Keara Fagan is falsely accused of insurrection against the British and sentenced to indentured servitude in Australia. The Irish native escapes on a ship bound for America with no money and the clothes on her back. Now, she must stay on the run while trying to survive in a strange land. As Dr. Elliot James travels by train from Philadelphia to York, a young woman faints at Keara Fagan is falsely accused of insurrection against the British and sentenced to indentured servitude in Australia. The Irish native escapes on a ship bound for America with no money and the clothes on her back. Now, she must stay on the run while trying to survive in a strange land. As Dr. Elliot James travels by train from Philadelphia to York, a young woman faints at his feet. He's sworn, as a physician, to aid the sick and injured, but fears this woman needs more than medical help. Enchanted by her beauty and touched by her dignity, he buys her a meal and offers her a place to stay in his small Pennsylvania town. To ask other readers questions about The Physician's Irish Lady, please sign up. The Physician's Irish Lady tells of a woman shipped from home against her will, and down on her luck and knight in frock coat. It's a sweet tale of two strangers meeting on a train, of the wish to do good going a little awry and yet....True love wins out in the end. If you enjoy Historical Romance, do give The Physician's Irish Lady a try! This is a nice easy read. I would liked to have seen more interaction/history between the heroine and the villain before she boards the train. Overall, a good story! Susan Macatee writes American Civil War and American Victorian romance, some with a paranormal twist. From time travels to vampire tales, her stories are always full of love and adventure. She’s spent many years as a Civil War civilian reenactor with the 28th Pennsylvania Volunteer Regiment. Besides writing romances set during the Civil War, she’s a big science fiction fan and hopes to encorporate Susan Macatee writes American Civil War and American Victorian romance, some with a paranormal twist. From time travels to vampire tales, her stories are always full of love and adventure. She’s spent many years as a Civil War civilian reenactor with the 28th Pennsylvania Volunteer Regiment. Besides writing romances set during the Civil War, she’s a big science fiction fan and hopes to encorporate that genre into a future romance story. Her other loves are reading most genres of romance, rooting on her favorite baseball team, the Philadelphia Phillies, and spending time with her husband and three sons.